The baked tofu sandwich does not take long to make and you can add a little spring mix on the side for some greens. The ingredients are available at most supermarkets. I find most of mine at Trader Joe’s. Nutritional Yeast – (I use either Red Star or Braggs.) Nutritional yeast has a fabulous taste to it! It is also a great source of B vitamins among other possible health benefits (this article describes the difference between brewer’s yeast and nutritional yeast). Slice some pieces of raw cheddar cheese and put it on what will be both sides of the sandwich. When the oven is warm, put the corning dish in the oven for about 12 – 15 minutes or until it looks cooked enough for you. I wait until the cheese is melted! After you have baked it, remove it from the oven, toast 2 slices of bread. Spread the pesto (I like a lot!) on the toast and put the tofu combination on the toast. Cut the sandwich and enjoy! If you come up with other ideas or ingredients that you think add flavor to this, please send me an email so I can try it too! Enjoy! 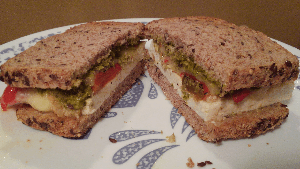 This entry was posted in Health, Nutrition, Recipes, Wellness and tagged ingredients, recipes, tofu. Bookmark the permalink.